Exactly 30 years ago, I met a girl named Hilary Scheer. My best friend, Missy Cowen, had outgrown her pony, Farnley Tango, and Hilary’s parents bought him for her. I met Hilary when I accompanied Missy to the Scheer’s farm to drop off Tango and say good-bye. Afterward, we kept track of Tango and Hilary and often cheered for them at horse shows. Over the years, Hilary and I grew up, went to college, got married and had children of our own. Our paths often crossed, though, as the horse world is a pretty small place, especially in Virginia where we often competed against one another and attended the same functions. But I have to say that even I couldn’t have imagined that three decades after we first met I’d be sitting in the bleachers with Hilary (now Gerhardt) watching our sons—on opposing teams—facing each other on the soccer field. 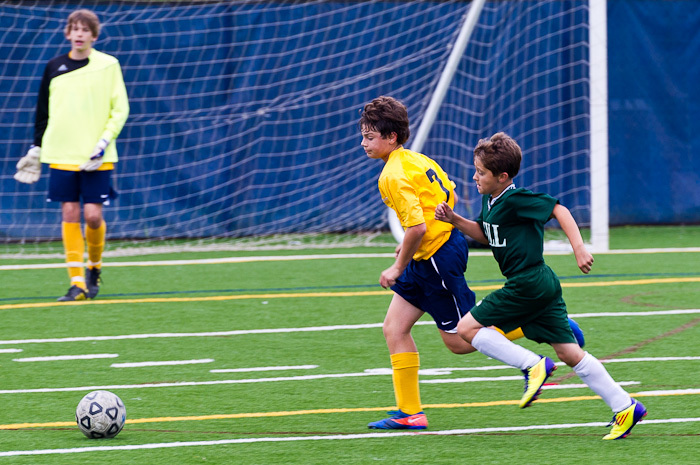 Hilary’s son Rich, an eighth-grader at Highland School, is one of the stars of their varsity soccer team. Cameron did his best to keep up with Rich as they fought for the ball, both digging in hard. In the end, it was a perfect outcome for us—a 0-0 tie. We all won! Super action shot and it is a small world indeed!